A peek at what I have been up for the last few days - pulling fabric, rotary cutting, arranging and rearranging, and stitching - including some late night work. I seem to be so much more productive in the small hours of the morning! I am working on a custom order for a low volume quilt with a balanced splash of color to set the tone for a pretty quilt with prints that tell a story. 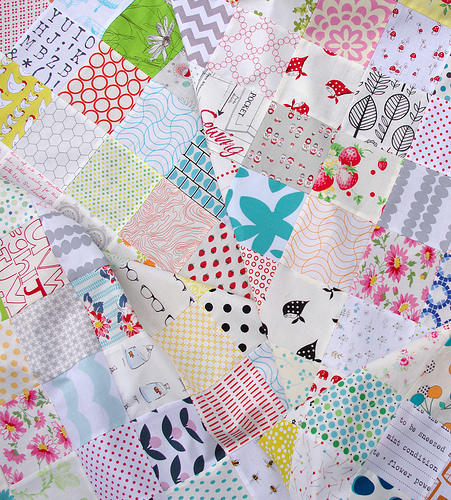 The quilt top is made up of many of my "fabric favorites"; some of which have been around for quite a while and are now highly sought after and hard to find, and some very new. Ten wedges pieced (and 80 fabric scraps rescued from my overflowing scrap bin) and thirty more wedges to go. Keep Calm and Sew On. More on both of these projects soon. The Dresden is looking very good. Nice interplay of colours. How big are the wedges? Love the Dresden! Hope you have a tutorial in the works! I love the quilt top! How big are the squares? Just finished another of your quilts - Pinwheels on Parade - always a pleasure. And I love both of these pieces - you just have that touch. And I've concluded that all/most quilters do some of their best work in the wee, small hours. It's always nice to know that someone of like interests is awake and quietly working when I am! Beautiful x 2. The Keep Calm Dresden is fantastic with color. you make beautiful things, rita. lovely! Only you could make a Dresden looks so amazingly colourful! There is something about low volume that is very appealing to me. Love this quilt. The wedge is wonderful ~ looking forward to more about it! Beautiful as always Rita! I love that your quilts are simple in design but beyond gorgeous when finished. You have a gift. What wedge ruler did you use? I need one for a color wheel I want to make. 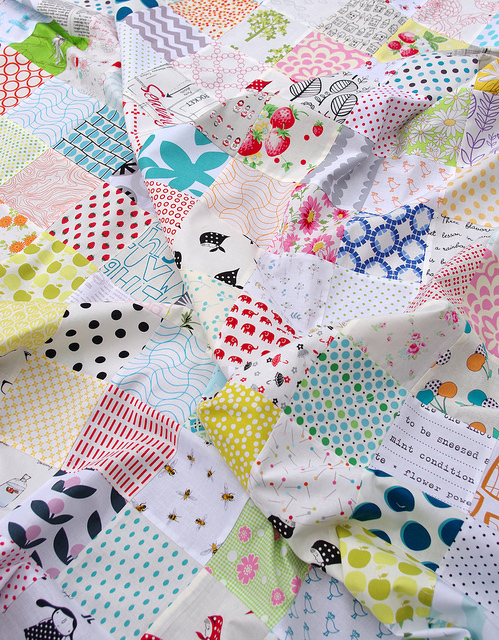 And you have made me totally fall in love with low-volume patchwork. 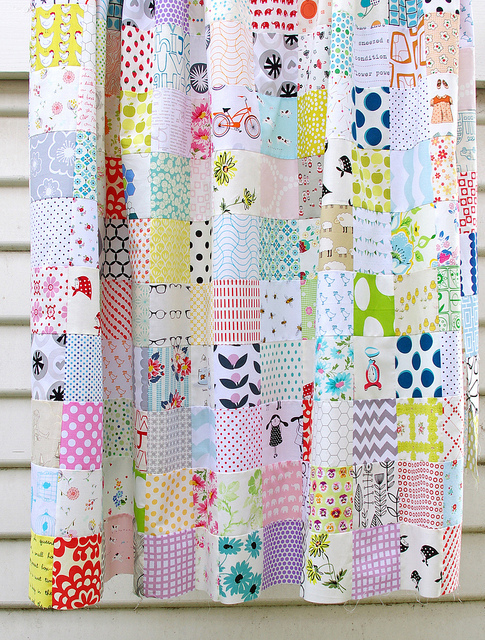 Definitely on my list of quilts to make! love the low volume scrappy squares! This would make an awesome shower curtain! Lovely lovely! both are perfection as usual. I love your work. I really love dresdens so I am excited to see what you are going to do with those. Both look great. As always. Pretty, lots of pretty things to see. I can't wait to see the finishes. So many pretty fabrics....thanks for sharing your progress...it always makes my day! I love how well your dresden project fits your style. I'm looking forward to seeing more of it! Always enjoy seeing your beautiful quilts. 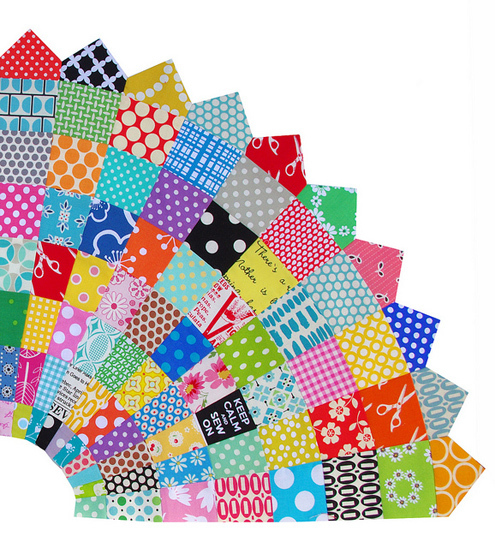 I want to make a low volume quilt but how do I get started? I don't have that many prints. Do you just go through store web sights looking for white background prints? Maybe you could post about this for others who might be interested. Thank you Rita. I think your quilts are lovely, can you tell me what batting you use please? - They look pretty low-loft from the photos.